Charges for transport are in accordance to the distance. This is reviewed from time to time and charges are subject to change depending on the prevailing fuel prices.All the buses have fulfilled Government regulation standards. 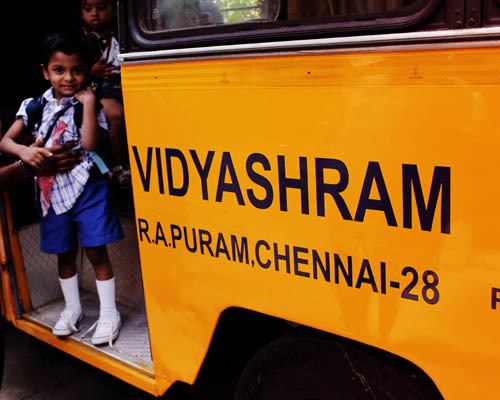 Trained drivers and helpers are provided for every bus for the safety of students. 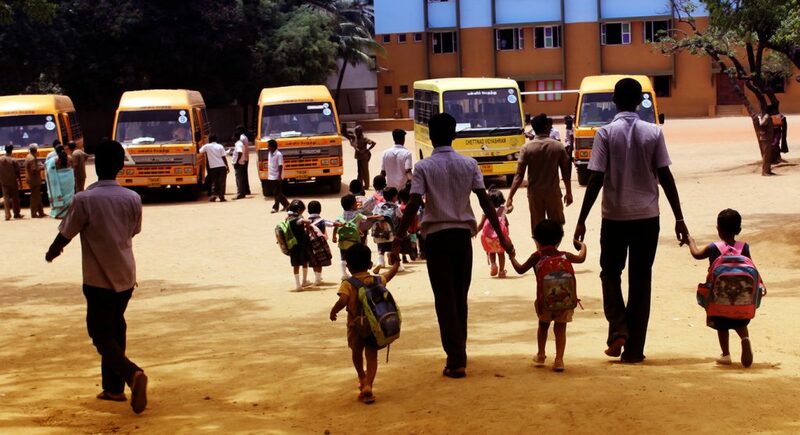 The transport service is safe and secure and will pick and drop students at specified stops only. The transport fee is collected for 11 months in a year and it is not refundable. Speed Governor is installed in all the buses and vans. This facility may not be available for students of class IX to XII. 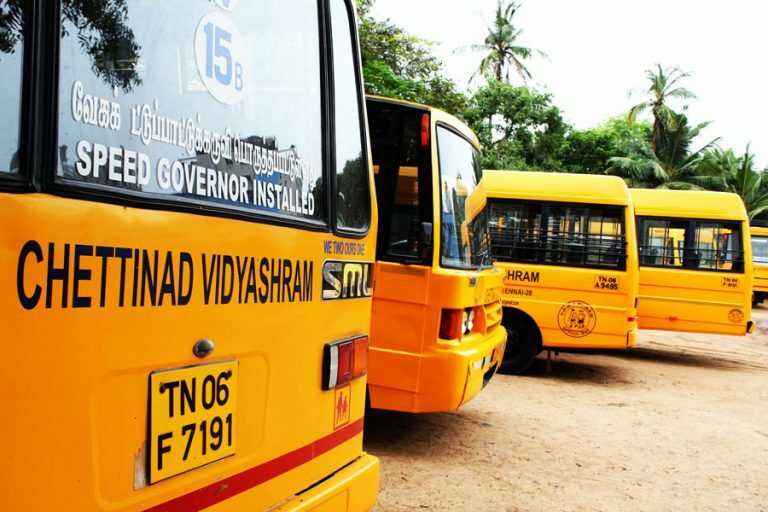 All the buses and vans of our school are being equipped with GPS from the academic year 2015-16 to provide safety and security to students and to respond faster to emergencies. SMS facility is also made available to notify the arrival of the bus at the specific stop to avoid long waiting hours at the bus stop. Abhiramapuram, Adambakkam, Adyar, Alandur, Alwarpet, Anna Nagar, Ashok Hotel, Ashok Nagar, Balaji Nagar(K K Nagar), Besant Nagar, Chepauk, Chetpet Rto, Chindadripet, Cit Colony, Cit Nagar, Foreshore Estate, Gopalapuram, Guindy, Ice House, Indira Nagar, K,K Nagar, K K Nagarammankoil, Kaiveli, Kalakshetra, Kamatchi Hospital, Kodambakkam, Kottivakkam, Kottur, Kotturpuram, Kovilampakkam, Luz, Madipakkam, Mahalingapuram, Medavakkam, Mandaveli, Mathyakailash, Metha Nagar, Mount Road, Mylapore, Nandampakkam, Nandanam, Nanganallur, Neelangarai, Nungambakkam, Palavakkam, Pallikaranai, Park Sheraton, Perungudi, Ramavaram, R A Puram, Royapettah, Saidapet, Saligramam, Santhome, Sasthiri Nagar, T Nagar, Teynampet, Thiruvalluvar Ngr, Thiruvanmiyur, Thoraipakkam, Triplicane, Vadapalani, Valluvarkottam, Valmiki Nagar, Vannandurai, Velachery and West Mambalam.